Specialist vehicles for transporting large loads. Built by the LNER as a machinery wagon and used to transport locomotive boilers. Stewarts & Lloyds (Minerals) Ltd, 40-ton well wagon built by Head Wrightson & Co. and used for transporting excavators, dragline buckets and heavy equipment into the quarries. Known as the “digger trolley”. 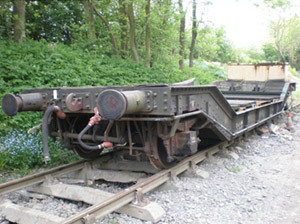 BR built three plank dropside wagon used as a runner and brake vehicle for the digger trolley.